There's a lot of interesting stuff on the web. Since the beginning, the hard part has been finding it. In the old days the only tools available were random browsing and directory sites like Yahoo!. These days it's more efficient to subscribe to weblogs that you've found are reliable sources of good links. 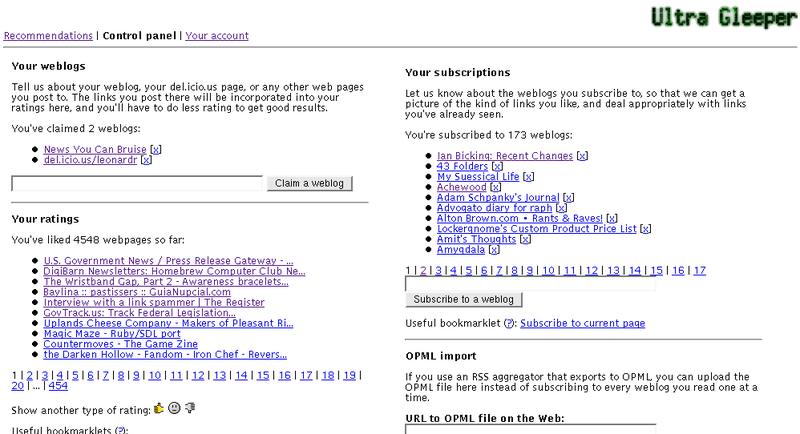 But the web keeps growing; now it's hard to find the new interesting weblogs, much less all the other interesting pages. The Ultra Gleeper takes your weblog subscription list and starts from there. It crawls the web for things you haven't seen and shows you the pages it thinks you'll like. Your feedback improves its ability to give accurate ratings. With the Ultra Gleeper can find new pages and new weblogs to read. 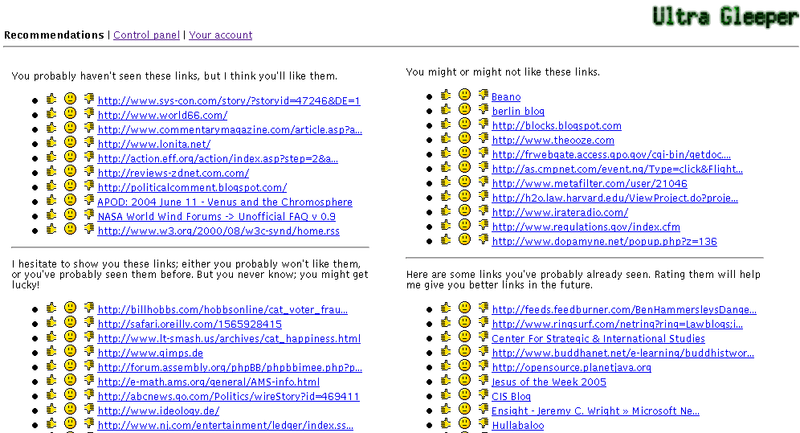 And if you have your own weblog or use del.icio.us, the links you post there will be automatically turned into ratings. The Ultra Gleeper solves or avoids the problems that give recommendation engines a bad reputation. It won't give you a lot of links you've already seen, because it knows about your subscriptions and what they've posted. It won't just recap the most popular links of the day, because its indie rock algorithm distrusts excessive popularity. It won't ask you for a lot of calibration ratings up front: you already gave those ratings by telling it what you subscribe to and pointing it to your weblog and/or bookmark page. The Ultra Gleeper runs on your server and shows up in your web browser or RSS reader. It's free software, so you're free to use and modify it. The secrets of the Ultra Gleeper are laid bare in its eponymous paper. I presented the Ultra Gleeper at CodeCon 2005, using the paper as my model and these slides. Ultra Gleeper 1.0.4 was released on February 13, 2005. It is made available under a 3-clause Berkeley license. Note: The Ultra Gleeper requires version 0.5.3 of SQLObject (available here). The Ultra Gleeper was intended as a proof of concept. I stopped development once I satisfied my curiosity. Anyone is welcome to build on the ideas mentioned in the paper, or even on the code, if you can get it to work on a modern system. This document (source) is part of Crummy, the webspace of Leonard Richardson (contact information). It was last modified on Thursday, April 12 2012, 14:08:25 Nowhere Standard Time and last built on Thursday, April 25 2019, 14:00:01 Nowhere Standard Time.